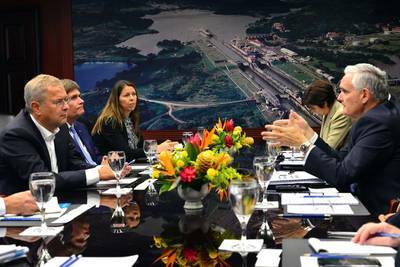 Within the framework of the centennial celebration, the Panama Canal Administrator Jorge L. Quijano received a Maersk Line delegation led by Søren Skou, CEO of Maersk Liner Business, to provide an update on the Expansion Program and discuss the future trends in the maritime industry. Administrator Quijano updated Maersk executives on the progress of the Expansion Program. He said that the plan is underway to ensure that the new locks will be open for transits in the beginning of 2016. During the visit, the delegations discussed topics of strong mutual interest such as the environment, efficiency of maritime services and economies of scale. The Panama Canal fully supports the sense of environmental responsibility that both organization share. The Canal’s fuel-saving shortcut has reduced the maritime carbon footprint for a century, beginning long before pollution and global warming became an issue. Maersk, through the improvement of the efficiency in their vessels design, operating procedures and other efforts to obtain substantial reductions in fuel consumption has become a leader in promoting a cleaner environment. For Maersk, Panama’s route is vital because it reduces time and fuel consumption. The expanded Canal will permit the transit of bigger vessels through the waterway that will allow for a more efficient connectivity and savings through economies of scale. These efforts have resulted in less health-damaging pollution today as well as for future generations by reducing CO2 emissions. Both parties concurred that the “green” concept is here to stay and is an important part of each organization’s future. This visit strengthens the relationship between these two major players in the maritime industry, which dates back to the early 20th century, when the first A.P. Møller vessels transited the waterway in 1917 and later established in 1934 a regular route between Baltimore to Asia through the Canal. “Maerk Line continues to be today one of the main customers of the Panama Canal,” said Administrator Quijano.